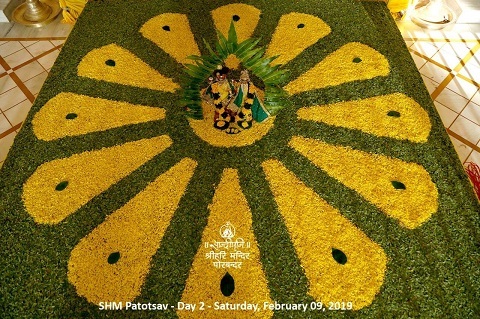 The 13th Shri Hari Mandir Patotsav celebrations began on 8th February 2019 with great enthusiasm in the presence of Pujya Bhaishri and guests from India and overseas, for five days. 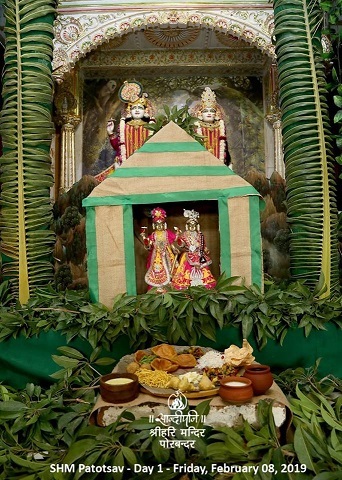 The Sadhana Kutir has been built to provide accommodation to sages and saints arriving at Sandipani during events. 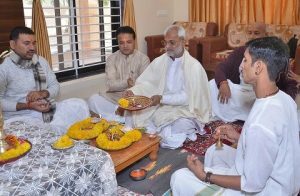 The Kutir was inaugurated by Pujya Bhaishri and Shri Anubhavanand Saraswatiji Maharaj, who has arrived to provide a discourse on Gitaji during the Patotsav celebrations. On day 1, several scholars who have qualified from Sandipani and present Rishikumars presented on interesting topics summarised below. 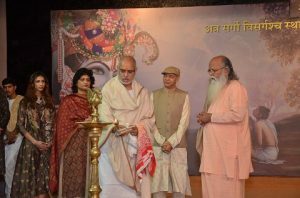 Rishi Kumar Karna talked on the Sanskrit language and Sandipani. He said that the tradition of Guru-disciple broken has certainly been disadvantageous. 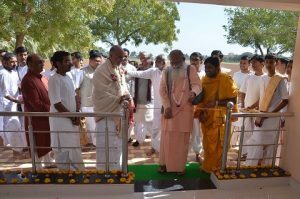 This has been revived by Pujya Bhaishri at Sandipani. Hardikbhai Joshi talked on the importance of conduct of teachers at Sandipani on the basis of the twelfth chapter of Shrimad Bhagavat. Shri Harshit Shukla explained the exclusivity of the story of Prahlad. 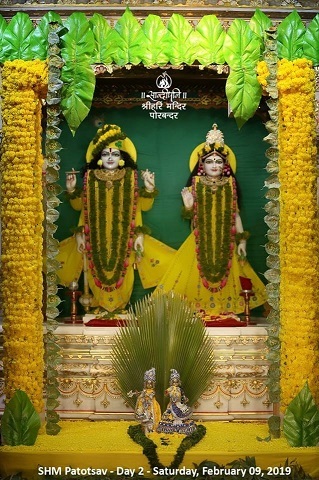 He said that Prahlad’s devotion to God did not start from birth, but from his Mother Kayadhu’s womb. 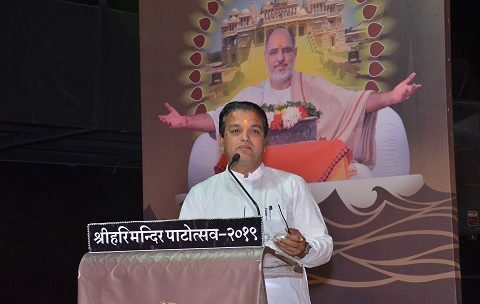 On day 2, the principal of Sandipani Rishikul, Shri Bipin bhai Joshi, spoke in detail on Kunta stuti from Shrimad Bhagavat. In the 26 ślokas of Kunta stuti, the first śloka starts with the nine types of devotion, three śloka describe the importance plus qualities of God, four śloka describe the activity of God, the rest of the ślokas represent God’s attributes, describe the purpose of incarnations and end with obeisance to God. 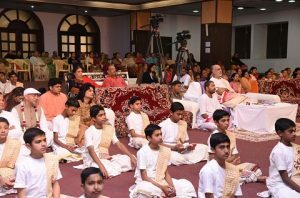 ­Gita Pravachan began on day 1 with the kindling of the auspicious lamp by Pujya Bhaishri, Swami Anubhavanand Saraswati ji and the chief host of Patotsav, Shri Vijaybhai and Shrimati Gauriben Goyal. 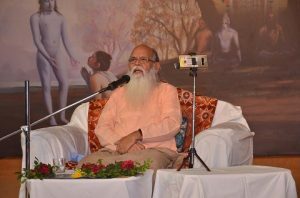 Below are a few enlightenining topics shared by Swami Anubhavandand Saraswatiji in his discourse. Conversation between Dhitarashtra and Sanjay. The four attachments described in Gita. Before Shri Krishna sang the Gita to Arjuna, the decision of war between Kauravas and Pandavas had been made. Lord Krishna Himself had tried to deter the war unsuccessfully. “Go, the war will start tomorrow”. The Pandavas went to sleep whilst Arjun started to think. Remember, devotion will run away in the presence of doubts. It is important not to weaken your faith. Let go any thoughts that give rise to doubt. So the thoughts gave rise to doubts within Arjun. A sceptical Arjun arrived in the battlefield on the first day of the war. When he then cried and raised his arguments, God rebuked him calling him impotent and cowardly. A person is not able to control one’s random thoughts leading to detriment. A human is not distressed due to thoughts, but due to the surge and erratic flow of these thoughts. This is what happens to a person suffering from depression who is dragged in the surge of powerful thoughts. Just like God rebuked Arjun, we must do so to our self and stop doubtful thoughts. Do not let unnecessary thoughts creep into your mind. If you want to summarise Gita in two words, you can say that the disease cured by it is endearment and the medicine used in Gita is equanimity. 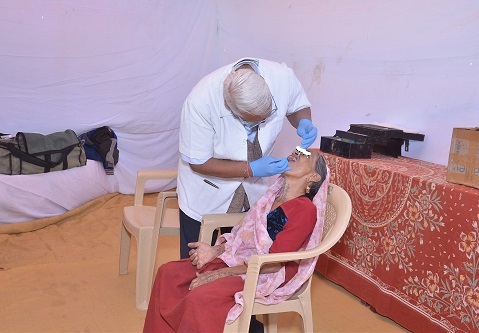 The first camp to begin is the dental camp on day one which will be carried out on all five days. A free bus service is being provided by Sandipani in the morning and evenings for all to benefit from this service and the Patotsav celebrations. Rishikumars at Shri Hari Mandir have been satisfying everyone’s eyes with attractive and beautiful darshan of the deities. On day 1, Lord Kristina’s story of the picnic with his friends was presented. 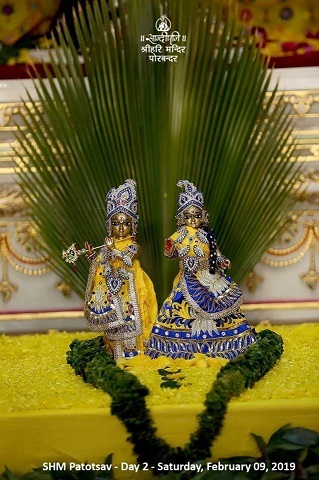 On day 2, the decoration and ornamentation was based on the arrival of spring.